Dixie Summit - Nut Hill Click on the image to enlarge and zoom. Dixie Summit – Nut Hill Roadless Area is 13,000 acres of furrowed land located on the Nez Perce – Clearwater National Forests, slightly northeast of the Gospel – Hump Wilderness. Its name is rather misleading, as neither Dixie Summit, nor Nut Hill, is included in the area’s frontiers anymore; Moose Butte at 7,100 feet is the most prominent topographical feature. A ridge runs south from Moose Butte through the roadless area; waters to the east of this ridge flow into the Red River (part of the Clearwater drainage) while waters to the west run to Big Creek and Crooked Creek, tributaries of the Salmon River. While some slopes are steep, most of the country consists of gentle hills and mountain meadows such as Big Creek Meadows stretching across the western portion and up into the tributaries, providing forage for wildlife. The rest of the area ranges from pure lodgepole pine stands on the southern slopes at moderate elevations to alpine fir and Engelmann spruce in the draws and at higher elevations. The canopy shelters Spacious monkeyflower, a rare bloom endemic to Idaho. Wildlife communities include elk, moose, deer, bear, and cougar. Dixie Summit – Nut Hill is also prime habitat for the grey wolf. Wolverine, fisher, and pileated woodpeckers are some of the Region 1 sensitive species found among the trees and grasses here. The watershed provides the cold, clear water necessary for prime steelhead, Chinook summer salmon, and bull trout habitat. A 1,000-acre Research Natural Area sits within the roadless area, located in the marshy grasslands along Meadow Creek and its tributaries. It includes the stream network itself, the nearby forest, and the mountain meadow environment’s ecological contributions. Though the roadless area itself is relatively small, it offers opportunities for fishing, hunting, camping, and horseback riding, and is very valuable public land as wildlife range and fisheries habitat. Intrusions from nearby development and off-road vehicle access pose the greatest threats until further protection for this important environment is instated. 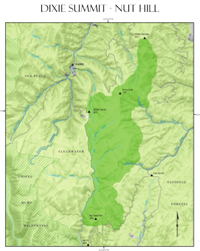 Descriptions of other Roadless Areas on the Nez Perce – Clearwater National Forests that qualify for Wilderness.